On Saturday the social bookmarking service Pinboard experienced some lengthy downtime. For those who rely on the service – like me – as professional archive, this was a problem. But it was a good example of why archives should always be backed up. This entry was posted in online journalism and tagged delicious, diigo, dropbox, Evernote, Pinboard, social bookmarking on November 17, 2014 by Paul Bradshaw. 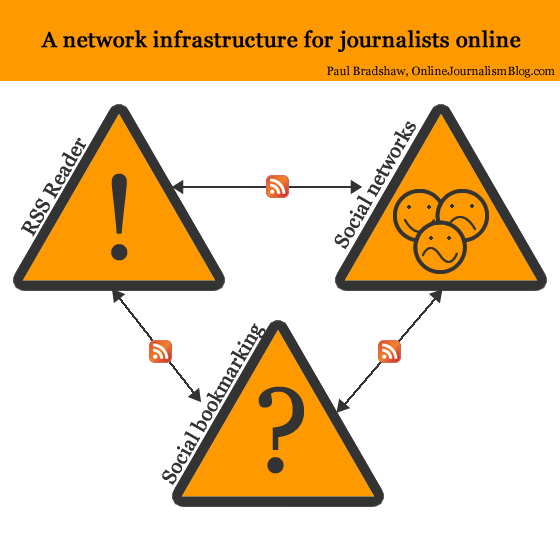 A few weeks back I wrote about my ‘network infrastructure’ – the combination of social networks, an RSS reader and social bookmarking that can underpin a person’s journalism work. 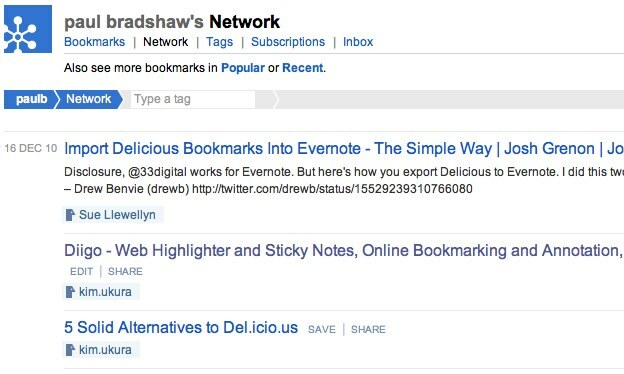 As I said there, the social bookmarking element is the one that people often fail to get, so I wanted to further illustrate how I use Delicious specifically, with a case study. Here’s a post I wrote about how sentencing decisions were being covered around the UK riots. The ‘lead’ came through a social network, but if I was to write a post that was informed by more than what I could remember about sentencing, I needed some help. Here’s where Delicious came in. I looked to see what webpages I’d bookmarked on Delicious with the tag ‘courts’. This led me on to related tags like ‘courtreporting‘. An article by Heather Brooke giving her personal experience of not being able to record her own hearing. A report on the launch of a new website by the Judiciary of Scotland, which I’d completely forgotten about. This also helped me avoid making the common mistake of tarring Scottish courts with the same brush as English ones. Various useful resources for courts data. Some context on the drop in court reporters at a regional level – but also some figures on the drop at a national level, which I hadn’t thought about. A specialist academic who has been researching court reporting. And all this in the space of 10 minutes or so. If you look at the resulting post you can see how the first pars are informed by what was coming into my RSS reader and social networks, but after that it’s largely bookmark-informed (as well as some additional research, including speaking to people). The copious links provide an additional level of utility (I hope) which online journalism can do particularly well. You can see how building this resource over time can allow you to provide context to a story quicker, and more deeply, than if you had resorted to a quick search on Google. In addition, it highlights a problem with search: you will largely only find what you’re looking for. Bookmarking on Delicious means you can spot related stories, issues and sources that you might not have thought about – and more importantly, that others might have overlooked too. 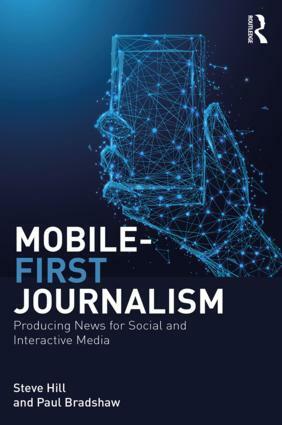 This entry was posted in online journalism, social media and tagged delicious, network infrastructure, social bookmarking, tagging on October 17, 2011 by Paul Bradshaw. Despite the incredible work done on the spreadsheet comparing social bookmarking services I am yet to find one that does everything that I use Delicious for (background here). One service I have been using, however, is Trunk.ly. Once you’ve imported your existing bookmarks from Delicious Trunk.ly stores any new ones you bookmark on Delicious, keeping the backup up to date. In addition it can store any links you’ve shared on Twitter, Facebook, Google Reader and any RSS feed. That said if, like me, you want to continue using Delicious but with an ongoing backup in case, Trunk.ly appears a sound choice. And it’s early days, so here’s hoping they add those features soon… *cough*. *Planned apparently. See Trunk.ly in the comments below. 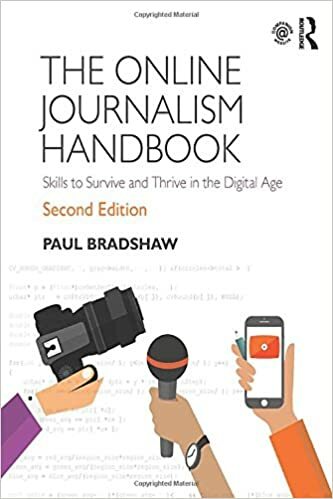 This entry was posted in online journalism and tagged backup, delicious, social bookmarking, trunk.ly on January 28, 2011 by Paul Bradshaw. UPDATE: I’ve created a spreadsheet where you can add information about the various services and requirements. Please add what you can. Delicious, it appears, is going to be closed down. I am hugely sad about this – Delicious is possibly the most useful tool I use as a journalist, academic and writer. Not just because of the way it makes it possible for me to share, store and retrieve information very easily – but because of the network of other users doing just the same whose overlapping fields of information I can share. I follow over 100 people in my Delicious network, and my biggest requirement of any service that I might switch to is that as many of those people move there too. So I’d like to ask: if Delicious does shut down, where will you move to? Publish2? Pinboard.in? Diigo? Google Reader (sorry, not functional enough for me)? Or something else? (Here are some ideas) Please post your comments. This entry was posted in social media and tagged delicious, diigo, google reader, pinboard.in, publish2, social bookmarking on December 16, 2010 by Paul Bradshaw. Searching is the most popular activity online after email. It is the prism through which we experience a significant proportion of the world’s information – from news and information about our community, through to health information, commerce, and just about anything that has a presence online. 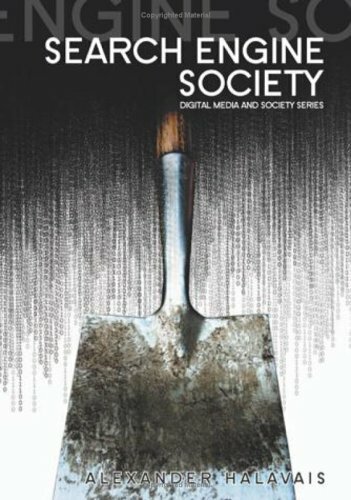 This entry was posted in online journalism and tagged alexander halavais, bioinformatic harvester, book review, censorship, delicious, digg, google, mobile search, PageRank, power law, preferential attachment, privacy, review, search engine society, semantic search, sociable search, social bookmarking, social search, twitter, vertical search, voila, wikipedia, wolfram alpha, yahoo on July 14, 2009 by Paul Bradshaw.